The ever-popular Amelia's Haus at Big Powderhorn Mountain Ski Resort has been acquired by UpNorth Lodging, furnished with many upgrades, and is now SnowBlind Chalet! We welcome all past Big Powderhorn Lodging guests of Amelia's Haus and invite new one's to experience all the comfort, amenities and hospitality SnowBlind has for you! This six-unit condo chalet, right at the base of Big Powderhorn Mountain--just two blocks from the brand new in 2012 Gun-Barrel Main Lodge, is a favorite of skiers, snowboarders and snowmobilers alike for it's ideal proximity to the Big Powderhorn Mountain slopes, the 26km Wolverine Nordic Cross-Country Ski Trails and direct access with no trailering necessary to Snowmobile Trail #2 and the blast of the vast network of hundreds of miles of awesome groomed western UP Michigan snowmobile trails and off-trail sledding fun the Lake Superior snow belt provides! 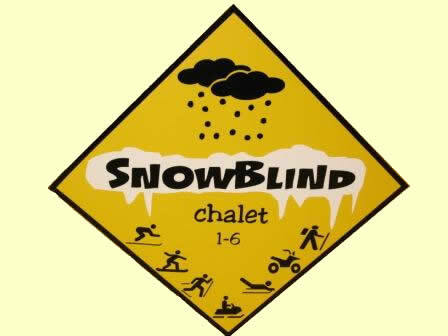 A long-time favorite of ski/snowmobile/ATV clubs, SnowBlind can easily accommodate your family/groups--large and small, all within the same chalet. There is plenty of plowed parking on site to store all your vehicles/trailers. Also, don't forget to ask about the lift vouchers we offer you to ski BlackJack, Indianhead and WhiteCap at a discount and remember to bring your favorite steaks/burgers to grill on one of SnowBlind's two BBQ gas grills under cover at the entrance to the chalet. Nestled right in the heart of "Big Snow Country" in the western UP northwoods, each condo in this inviting six-unit chalet offers comfortable lodging for up to six guests with a fully-equipped modern kitchen, two roomy bedrooms--each with queen beds, two full bathrooms, premium mattresses, linens, goose-down bedding and towels, gas fireplace and the advantage of your own private six-person cedar-surround hot tub room. That's right, no sharing with other guests or sign-up schedules here. Your own relaxing hot tub spa is steaming away in your condo waiting just for you after an exhilarating day on the slopes and trails! When it's time to ski/board--it's just a short walk to the lifts of the top ranked Big Powderhorn Mountain runs--or dial up the complimentary shuttle to pick you up and bring you back to your SnowBlind doorstep or any other of the many choices in the Powderhorn area for great food, cocktails, activities and entertainment. For variety, BlackJack Ski Resort, Indianhead Mountain Ski Resort, the ABR Cross Country Ski Trails, Mt. Zion Snow Tubing Park and legendary nightlife of Hurley, WI are all within 5 miles and the WhiteCap Mountains Ski Resort is just a short 13 mile drive, so stay for a weekend or play for a week--you never run out of big fun in Big Snow Country! The ever-changing wonders of the seasons makes a Spring, Summer and Fall retreat to the Lake Superior northwoods one that doesn't take a back seat to anywhere. The pristine beauty of the western UP lakes, waterfalls, beaches, parks, harbors, wildlife and brilliant fall colors makes this a destination that does nothing but rejuvenate the soul. You're in the Lake Superior UP northwoods now! Stress melts away this far north and with our off-season rates--you won't find a more attractive value. The summer chalet offers a beautiful semi-private wooded corner lot with picnic table, umbrella, gas grills and firepit with surrounding adirondack chairs. These vacation rental chalet condos are yours by the day (2 night min stay/3 night min-holidays) or by the day/week during the spring/summer/fall seasons. We offer the advantage of flat nightly rates and charge no reservation fees, cleaning fees or hot tub surcharges. Tax additional. Hot tubs operate seasonally. Each of the six Chalet units comfortably sleeps up to 6 guests. 1 queen bed in each of the two private bedrooms-plus one pull-out sofa bed in living room. Inflatable air beds with complete bedding sets available for your free use upon request. SnowBlind is entirely WiFi enabled--free for your use! No increased January MLK holiday weekend rates here! 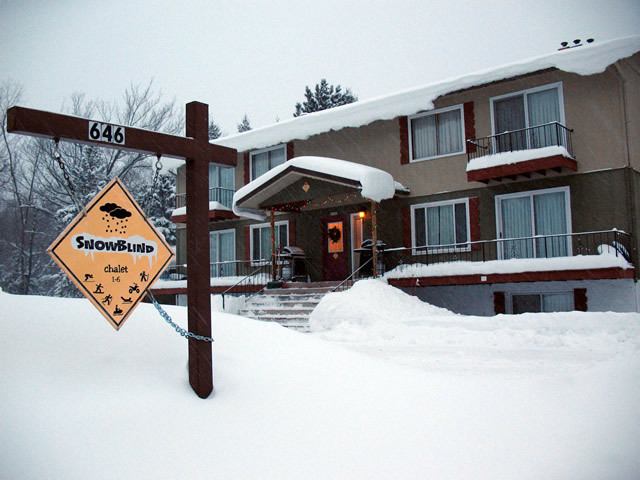 *SnowBlind has a single one-bedroom/two-bath condo available within the chalet at lower rates. Please call for details. Advance deposit of one nights stay to hold your reservation. Final payment (add 8% room tax) plus a $250 refundable security/damage deposit is due 14 days prior to stay, except for holidays when it is due 30 days prior to stay. Reservation cannot be cancelled after final payment is due or deposit will be forfeited. Minimum stay of 2 nights/3 nights during holiday. Please note that all properties are strictly non-smoking. Pets accepted with prior approval within SnowBlind. The Hurley/Ironwood area is a getaway dream that has become a tradition. Bookmark me for your next stay, too! and are the property of Up North Lodging. Copyright © 2015 Up North Lodging, All Rights Reserved. With the incredible volumes of season extending lake-effect snow, 1000+ miles of regularly groomed snowmobile trails, FOUR major ski resorts (WhiteCap Mountains/Skye Golf, Big Powderhorn Mountain, Indianhead and BlackJack) and the highly rated Wolverine, ABR, Uller and Montreal groomed Nordic cross-country ski trails all within minutes of our lodging; this IS the premium destination in the entire Midwest for snowmobiling, skiing and snowboarding fun! Summer Up North is no slouch either. The ATV Trails are a blast! Yeah, we have MUD. From the shoreline vistas overlooking Lake Superior at Saxon Harbor; through the rugged elevations of the ancient Penokee Mountain Range; to the historic Plummer Mine and it's 80 foot tall headframe--the last one still standing on the mighty Gogebic Range; to legendary Silver Street in Hurley and everything yours to explore in between--Red Birch Haus, Powderhorn Northwoods Suite and SnowBlind Chalet put your trail-blasting ATV home base right at ground zero in four-wheeler paradise! Try it out--you'll be glad you did!